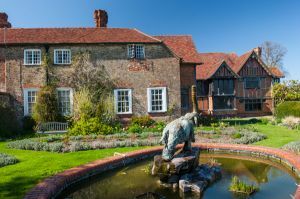 Dorney Court is a rambling Tudor manor, the home of the Palmer family for over 450 years. The house showcases early family portraits, needlework, and works of art in an attractive set of Tudor and Elizabethan rooms. The galleried hall is especially attractive. The Dorney estate dates to the Domesday Book, but the first written record of a house does not come until 1514. The manor was probably built around 1440 by Sir James Palmer and it has remained amazingly unchanged since then. Generations of Palmers have resisted the urge to follow the dictates of fashion, and as a result, Dorney is essentially a medieval house, oozing history and charm in equal measure. It is remarkable to think that if Sir James were to walk through the doors of the house today he would immediately recognise the house, so little has it changed down the years. At the heart of the house is the Great Hall, the centre of manorial life, where the lord would dine and where business was enacted. On one side of the hall is a wooden screen leading to a cross passage to cellars, kitchen, and pantry. At the other end of the hall is the Parlour, possibly the oldest part of the house. Above this, on the first floor, is the master bedroom, originally the Great Chamber, or family quarters. This chamber features a high, barrel-vaulted ceiling, and a full tester bed with beautifully carved Tudor posts. One of the most interesting features of the Great Chamber is how many times it has been used in film productions. Among many characters that have been filmed here are Hercule Poirot, Miss Marple, Sherlock Holmes, and Lady Jane Grey! The Palmers of Dorney have led interesting lives; Roger Palmer was a firm Royalist and risked his life to bring Charles II back from exile after the Civil War. When the monarchy was eventually restored Charles rewarded him with the Earldom of Castlemaine. There is a more famous Castlemaine, however; the new Earl's wife, Barbara Villiers, who was perhaps Charles's most famous mistress (though you can make a case for Nell Gwynn fulfilling that role). The Countess had several children by the king - and perhaps even the first 'official' Palmer child, Lady Anne, whose portrait is on the wall of the Parlour. Charles certainly thought Anne was his child. There is an odd story attached to Dorney and the Palmers. According to the tale, Charles II was treated to one of the first pineapples brought back to England from Barbados. After finishing the delicious fruit he gave the spiky top to Roger Palmer. Palmer, in turn, brought it back to Dorney and planted it. The pineapple grew, and eventually produced fruit, the first pineapple to grow in Britain. Palmer gave the fresh fruit to the king, and from that moment the pineapple became the [unofficial] symbol of the Restoration period. A carved statue of a pineapple stands in the Great Hall, and the motif is repeated throughout the house. One of the historic highlights at Dorney is a piece of Elizabethan tapestry, given as a wedding present to Thomas Palmer in 1624 by his mother or grandmother. The tapestry is one of the finest examples of Elizabethan needlework in existence and depicts the lives of various Palmers in the 16th century. The tapestry was lost for many years and only rediscovered to Dormey by chance when Country Life magazine ran an article on it in 1902. Immediately behind the house is the Norman church of St James the Less. This is a delightful historic building, on a spot that has been used for worship for over 1000 years. There are remnants of Saxon stonework in the lower parts of the walls, and the church is entered through a porch built in 1661 to commemorate the birth of Lady Anne Palmer. We were shown around the house by a wonderful guide. The whole visit was informal and friendly. You really got the sense of Dorney being a family home, rather than a showpiece. Unfortunately, since it IS a family home I was unable to take photos inside, but hopefully some of the exterior photographs will give you a sense of how beautiful the house is. When I was leaving I thought I'd buy a guidebook. As I approached the card table set up by the front door my guide was in conversation with another woman who proved to be the owner. When I said I wanted a guide the owner grimaced and said she wasn't terribly happy with the printing job they'd had done on the guidebook. She could sell me the guide but insisted that I only pay half the price, and take a handful of postcards, free, to make up for the guidebook quality. Actually, I thought the book was fine, but I came away with a nice history of the house, church, and estate, as well as a handful of free postcards! Note: in case someone objects, we've listed Dorney under Buckinghamshire, as it is technically north of the Thames in Bucks, even though the postal town is Windsor, across the river in Berkshire! Location: 2 miles west of Eton, off M4 at Junction 7. Well signposted. On site parking.